span style="line-height: 22px;">There are several brilliant strategies to select gifts when we come back to China. One is to choose those which have huge price gaps between two countries. And the second is to choose those which are only sold in the US. Amazon has popular Vitamins & Dietary Supplements that are perfectly satisfied the principles mentioned above. Nature Made Fish Oil Adult Gummies for $6.97. Nature Made CoQ10 Adult Gummies for $11.59. Caltrate Gummy Bites for $17.01. #1 Best Seller in Omega 3 Nutritional Supplements! SmartyPants Gummy Vitamins with Omega 3 Fish Oil and Vitamin D for $12.82. SmartyPants Kids Fiber Complete with No Sugar Added, Multi plus Omega 3 plus Vitamin D for $12.22. L'il Critters Calcium Gummy Bears with Vitamin D3 for $6.76. 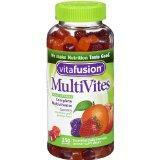 VitaFusion MultiVites Gummy Vitamins for Adults for $8.22. Centrum Flavor Burst Adult Chews for $15.27.